[SatNews] Proteus FZC has launched a fast-turnaround habitat mapping solution designed specifically for Environmental Impact Assessments (EIAs). Through the service, Proteus delivers high-resolution classification maps of terrestrial areas onshore and the seafloor in shallow-water marine environments. The Proteus habitat mapping service can be completed in a fraction of the time and is cost effective compared with traditional mapping methods. The solution is designed for use by engineering and construction firms, environmental consultancies and government agencies involved in the development of energy infrastructure, pipelines, power stations, desalination plants, port facilities and other projects where EIAs are mandated. Mapping sensitive marine habitats in the coastal zone is a particularly challenging aspect of EIA preparation, explained Critchley. Divers are typically deployed to collect hundreds of ground truth points underwater, which are later used to delineate the boundaries of various habitat or land cover types on the seafloor. This process is time consuming, logistically complicated and does not provide a full picture of the sea floor environment. For its mapping solution, Proteus obtains high-resolution multispectral imagery from commercial imaging satellites, such as DigitalGlobe’s WorldView-2 platform, which are capable of quickly capturing data anywhere in the world without the limitations of aircraft and ships. 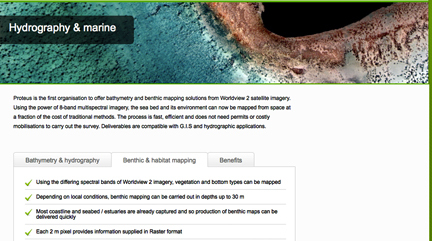 Proprietary processing techniques derive accurate land cover and seafloor classifications from the image data for generation of habitat maps. Offshore, the habitat classification process is accurate to a depth of up to 20 meters, depending on water clarity. The minimum mapping unit varies with the client needs and resolution of satellite imagery. Satellite-derived bathymetric data is also offered as a product of the technique. Since 2011, Proteus has been delivering solutions for mapping and classification projects using multispectral satellite imagery. These mapping projects have been delivered for environmental, oil & gas, engineering and other coastal zone applications in Europe, USA, the Middle East and Caribbean.